Lummi Nation is off to another strong start in 2016 and Coach Sandusky talks about the success of the Blackhawks. He discusses the week two game against rival Neah Bay, top players on this year’s team, and the way football brings the community together in town. The 2015 Gridiron Classic opened with the always exciting eight-man championship from the 1B classification with Almira-Coulee-Hartline from the Northeast League and perennial contender Lummi Nation from the Northwest. 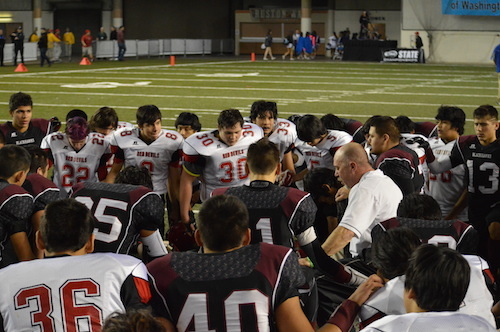 The ACH Warriors would be making their first trip to the title game since 2011 while the Blackhawks were finally able to beat Neah Bay in the semifinals who ousted them in each of the last four seasons. As many 1B games typically transpire, the scoring started early and often. Almira-Coulee-Hartline marched down the field in the opening seven plays and capped off the drive with a 19 yard run by Dallas Issak to the endzone. 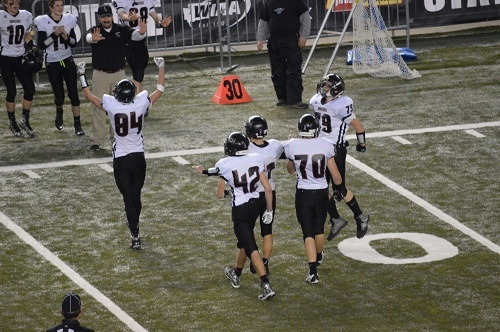 Lummi returned the favor when Hank Hoskins punched it in from three yards out on the next drive. This exchange marked the beginning of a back-and-forth shootout that would last throughout the entirety of the first half. 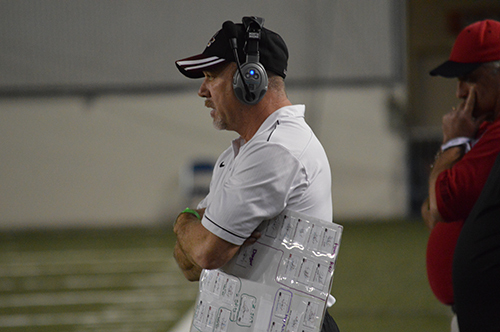 Lummi’s Free Borsey helped the Blackhawks return the contest to a one possession deficit in the final minutes of the second quarter by returning a kickoff 53 yards for a touchdown. The Warriors countered with a series of plays that resulted in a touchdown with only four seconds remaining. The scoreboard read 38-28 at the break in favor of the visitors east of the Cascades. This is when the game got ugly. Scoring dried up like the scablands near the Grand Coulee Dam. Lummi seemed to have the edge coming out of their makeshift “locker room” at the TDome. The pace of play screeched to a halt when the action resumed as injuries stoppages and penalties dashed a sense of continuity Hoskins and Borsey each scored another touchdown to give Lummi a 42-38 lead heading into the final frame. The inability for any team to develop any sustained drives kept the score locked for the majority of the final twelve minutes. As both teams refused to punch on fourth down, the pigskin changed hands often. With 1:35 left, Charles Hunt gave the Warriors a 46-42 advantage. Lummi had one last gasp. Starting quarterback Jonathan Casimir was replaced by Hoskins at quarterback due to injury and with thirty seconds left, he aired it out. Caught by Free Borsey who glided to the endzone! But wait, a flag on the play! Offensive holding nullified the score and on fourth and long, Payton Nielsen made the game-ending tackle to turn the ball over to the Warriors who set up for one final play, victory formation. Congratulations to Almira-Coulee-Hartline on their 1B championship!